Sorry for not getting around to this sooner, but good news to report anyway. The weather for most of the second week of the season remained unseasonably hot, dry and windless. It didn’t hurt the fishing one bit however, as week 2 (as has historically been the case) remained outstanding. 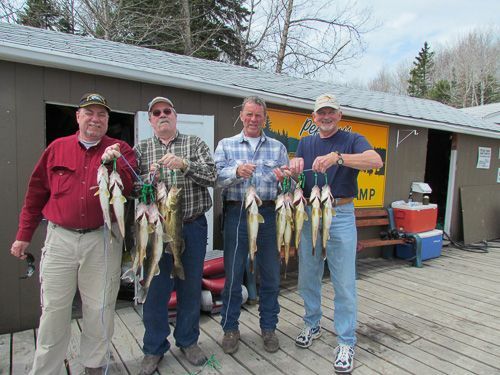 All guests in camp were repeat guests and overall found the walleye fishing to be pretty easy going. 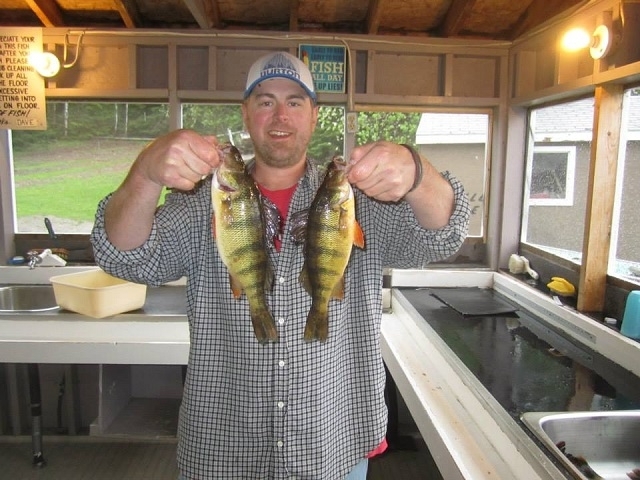 Fishing jigs, plastics, cranks, worms walleye were easy to be had in waters ranging from 6-12 feet for the most part. Many pike over 30″ were also recorded during the week with the largest a 39″ pike caught and released at Lost. The warm weather had water temps pushing 70 degrees and the smallies were susceptible to about everything thrown at them as they cruised the shallows getting ready to spawn. A lot of big smallmouth were caught and provided awesome entertainment and a welcome break from the great walleye fishing. Some cooler weather did arrive by weeks end and pushed the smallies back out of the shallows, only to see the weather warm back up in week 3 and get them prowling the shallows again. Gar Holcomb’s annual crew of six, while not hitting the water quite as hard these days, still managed to catch just over 800 fish for the week. While those numbers weren’t recorded by every group in camp, everyone left very happy with a solid week of fishing. The perch fishing was pretty good for those who targeted them and stuck with it, as the perch (like they always do) were moving and sometimes hard to locate. Week 3 began with cooler temperatures, some rain and winds. Public enemy number one. Fishing remained very good however, up to the return of the sunshine and heat by weeks end when things did cool down (fishing wise) somewhat. Certainly one of the highlights of the week was KC police officer, Jeff Littlejohn, catching a 30″ walleye back at Lost on his last cast of the trip on Friday. What a way to put a bow on a great week of fun, friendship and good fishing. Only one new group in camp with us during the week, and Mark and his son Jason certainly had no trouble figuring out the walleye bite as they were on fish consistently starting on Saturday with their arrival. Some of my old friends from Granger were back in camp after taking about 6 years off and thoroughly enjoyed themselves talking about how much they missed this place and already looking forward to bringing the crew back next year. Good friends, Bob and Sandy and Bonnie and Charlie, were in camp as well. Bob for, what I believe, was his 29th year. After a near-death experience with septic shock last year, it was great to see Charlie back on his feet and doing so well. Can’t wait to see them again next year. 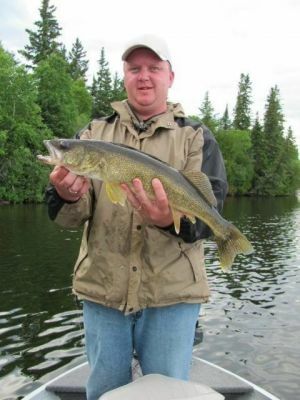 Windy days kept the walleye shallow <12 feet most days and when the wind wasn’t blowing, reports of good walleye fishing out to 18 fow or more were also mentioned. Mike D- 23″, Sandy B- 20, 20, 19,19″.